The flutes you buy at Stonelaughter Flutes are made with a nod to the Native American “Woodlands” design*; the block (or bird, or fetish) has a flat base, and the air channel is carved into the body of the flute. 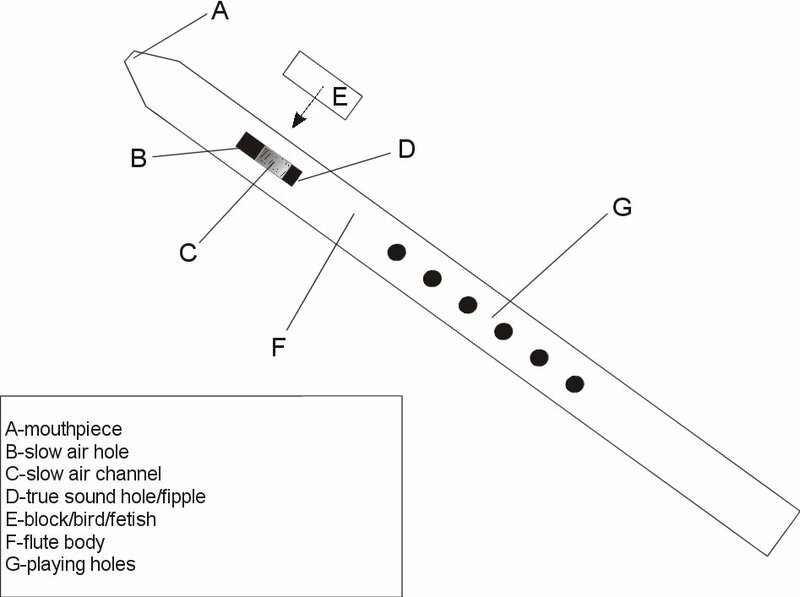 Have a look at the diagram below which shows the basic idea of how the flute does what it does. At A the player blows into the blowhole, and the air enters and circulates in the “Slow Air Chamber” (B). Between B and C there is an exit hole which is covered by the block (F) – which also forms a very narrow channel at C. This channel speeds the air up and reduces its pressure (thanks to the Bernoulli Effect) and to an extent makes the flow laminar. As this air exits the channel at D, it strikes the sharp edge (called the fipple). This splits the airflow in half; but instead of splitting cleanly, the air oscillates above and below the fipple and produces sound waves at E. These are what we hear when we play the flute. The pitch (frequency) of the sound is directly related to the length of the flute’s body; which we can artificially adjust by covering and opening holes in the flute’s length. This is how we get the flute to produce different notes; and of course music.